Over the past ten years of photographing weddings, one thing that I have learned is that I really adore photographing engagement sessions. There is something so special about this phase of life. You’re planning a big party to celebrate you and your best friend, and you get to spend an entire day celebrating that newfound love and togetherness while a photographer follows you around – what’s not to love? Now I realize to some people, this sounds like a nightmare, but it really is a TON of fun! But one thing we are often asked is “What if we want to skip an engagement session? Can we save money if we do that?” or another version of a similar question, “We already have engagement photos that our friend did or we did on vacation, so we don’t need that. Is there any way to take that out?” We get these questions and all the different iterations of it ALL. THE. TIME. Today, we’re going to talk about why we STRONGLY believe that you shouldn’t skip your engagement session. We know there are always unique situations of course, but we overwhelmingly believe that every could should plan to have an engagement session with their wedding photographer. 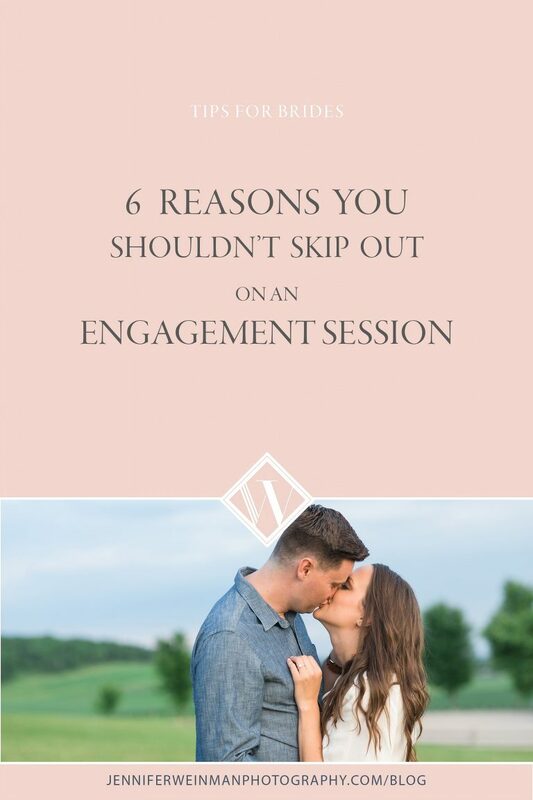 Here’s our six reasons why you should skip your engagement session! 1. It’s a great opportunity to familiarize yourself with your photographer’s shooting style and personality. No two photographers are alike. Even husband and wife teams that work together regularly are going to have different approaches, styles, and personalities. It is SO important to witness your own wedding photographers style in advance of the wedding day. What if you totally don’t get along? Or what if all of their instructions are very confusing or poses unflattering? Wouldn’t you rather know that BEFORE your wedding day? The engagement session is almost like a trial run for your wedding photographer, and we wholeheartedly believe that when you have a great engagement session, it leads to great wedding photos. And while we haven’t had anyone come back to us after an engagement session unsatisfied (knock on wood!) we have had several brides book with us that chose to end prior contracts with other wedding photographers after engagement sessions didn’t go well. And a special note here to people who do an engagement session across the country (we get this one a LOT!) — we STILL recommend that you do one with your wedding photographer, even if it is just a few days before your wedding! It does help and it does make a difference in your wedding photos! We’ve seen this first hand, and we really do love whenever we can meet our couples ahead of time and photograph them. Yes, we have done engagement sessions within a week of a wedding, and we still love them. 2. You’ll build trust with your photographer. Photography is a bit of a two way street – we need to get to know you in order for you to trust us, and you need to get to know us in order to trust us. Trust is HUGE when you are entering into a day full of family, traditions, and meaning, and nothing helps us establish that level of trust better than an engagement session. When you understand how we as photographers will interact with you, speak with you, then you’ll know what to expect on your wedding day. It will also help you feel more comfortable asking questions or proposing your own creative ideas. During your engagement session, you’ll get the opportunity to see us in our element, and we become less of a stranger with a lens. This allows us to show up on your wedding day not as a stranger with a lens, but instead as a familiar and friendly face that is welcomed easily and trusted fully. 3. You’ll get all your nerves our BEFORE your wedding day. If you or your fiancé are not a fan of having your picture taken OR you tend to be a person who gets nervous when attention is focused on you, the engagement session is DEFINITELY for you. Having one less unknown on your wedding day (how things will go with your wedding photographer) will give you one less thing to worry about, and increase your confidence level. We’ve also found that for grooms in particular, especially ones that don’t love being photographed, our engagement sessions clear away any of those feelings and they actually get EXCITED for their wedding day! 4. It’s a chance to practice your posing. We walk you through a lot of the basic poses we do on your wedding day during your engagement session. You get to practice a bit, and see what it feels like! And the best part is that we get to see how you and your fiancé naturally interact with each other, that way when we do lead you into poses, we know what your authentic smiles and laughs are like. Being able to make these observations helps us click the shutter at the best possible moment so we get great moments that are genuine, instead of forced grins that are stiff and awkward. Engagement session images are some of our couples’ favorite images! You have images you can use for save the dates, give as gifts to family, use for social media profile images. But it’s also a wonderful opportunity to do a trial run of hair and makeup, or perhaps try out a possible hair color a few months early. We’ve had couples rent outfits to wear for fun, and others plan special dates in conjunction with their engagement session. We’ve also had couples make a trip out of it and visit family back home, or even better, create a destination engagement session in places they are visiting that they never want to forget! There are lots of ways that engagement sessions can be special and unique for you as a couple, and we’re always happy to make suggestions if you’d like! 6. You’ll have better wedding photos. No two couples are alike, and discovering which poses and prompts to use and which ones to avoid takes some deciphering. We’re not ones to rush that process, and while we are confident in our ability to enter into tricky situations and do an amazing job with very little preparation, we’d prefer to have the opportunity to photograph you before your wedding day because we know it will mean even BETTER wedding day images. So really, it’s not about your engagement images. It’s about your wedding images. So in the end…we actually don’t do anything differently when couples ask us to skip the engagement session or let us know they’ve already had one, because we WANT to do one with every wedding couple we work with! It’s part of our packages for a reason, and we know that it helps our clients have an amazing experience and enhances their wedding day. So really, it’s not about your engagement images. It’s about your wedding images. This is the main reason we include an engagement session complimentary in ALL of our wedding packages — you have nothing to lose but mediocre wedding images that lack connection, and EVERYTHING to gain!